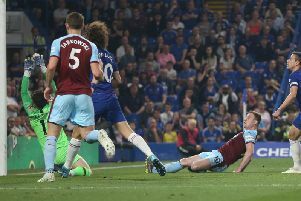 The Championship’s leading scorer Andre Gray doesn’t want the Clarets to have to rely on the lottery of the play-offs to gain promotion this season. The 24-year-old, who has netted 17 goals this season, was part of the Brentford side beaten by Boro over two legs last term. Gray equalised at Griffin Park after Jelle Vossen had broken the deadlock for Aitor Karanka’s side. However, Fernando Amorebieta scored in stoppage time to give the away side the advantage. Boro then cruised to a 3-0 win at the Riverside to book their place at Wembley where they were beaten by Norwich City. “I want to do it automatically and do it the easy way instead of going through the play-offs again because anything can happen,” said the £6m record signing following the FA Cup tie against Arsenal at the Emirates. “It’s good to test ourselves and it just proves that we’re capable of competing in the Premier League. The Gunners fan added: “I was buzzing but as soon as the whistle went it all blocks out and you forget you’re playing in front of 60,000 at the Emirates. “It was just a normal game in the end. I’m quite frustrated, but at the same time we’ve got to take the positives out of it. “Obviously we want to win games. We don’t go into any game to lose, but it’s done now and we need to concentrate on the league and concentrate on playing them again next season.